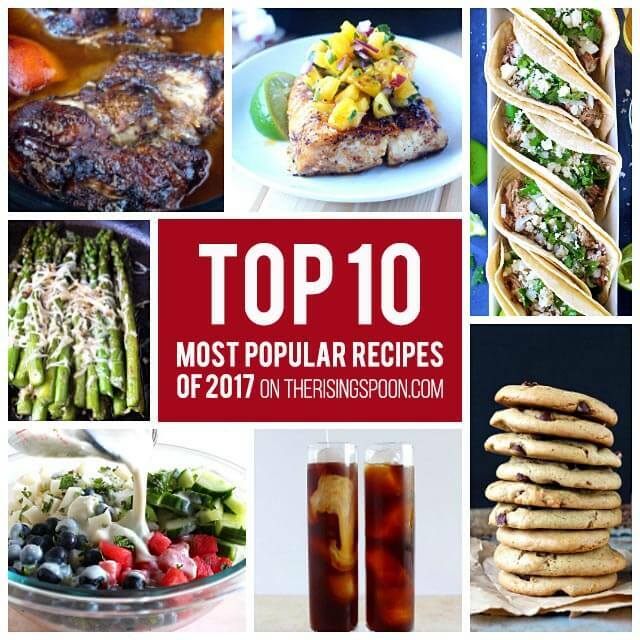 I've rounded up the most popular posts published on The Rising Spoon in 2017! These recipes had the highest number of visitors and shares on social media in the past year, so if you haven't tried them yet...there's no better time than now. Every January when I go back over what I've created here on the blog the past 12 months, I feel an overwhelming gratitude for my readers. Whether you are a new or returning visitor, thank YOU for hitting the pause button on your busy day to read my blog, leave a comment, share a post, try a recipe, open one of my emails, and/or a start conversation on social media. It means the world to me! The feedback I've received via messages, emails, and comments + the online relationships I've forged are what lights a fire under my bum to keep creating and improving, all the while growing a community of like-minded folks interested in real food recipes, non-toxic DIY crafts & natural living tips. If I can change just one person's life in a positive way, then I've done my job. In 2017, I jumped into a new medium - recipe videos! I bought a basic tripod for my DSLR camera, several big white foam boards, a large plank of wood for a shooting surface, and starting rolling with no experience and a few basic tutorials to guide me. So far, I've made 14 short recipe videos (you can see them here on my Facebook page) and with each new one, the process gets faster and easier. 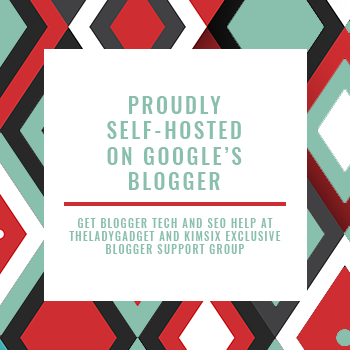 And after nearly 5 years with the same template & logo, I redesigned The Rising Spoon with my favorite colors and switched to a cleaner, easier to navigate blog template (with the help of The Lady Gadget). I am so happy with how it turned out and it was a long time coming! However, the highlight of 2017 was my feature in the U.S. December print issue of Glamour (you can see a short video of me holding it here on Instagram). A freelance writer for the magazine reached out to me in August, put me in contact with an editor, and I was given the opportunity to create three unique food gift recipes (one of my passions) for their holiday issue. It was a serious dream come true to be in print and look inside a magazine with my name + face in it while standing in a Barnes & Noble bookstore. I'm a geek like that. :) Now that the issue is no longer on newsstands, I'll be sharing those same recipes here on the blog in the coming months, so keep an eye out for them. Note: If you're a new reader, check out my past "best of" round-ups to see what was popular then (some of them are still my all-time top posts). Are you a new reader or want to catch up on posts you missed throughout the year? 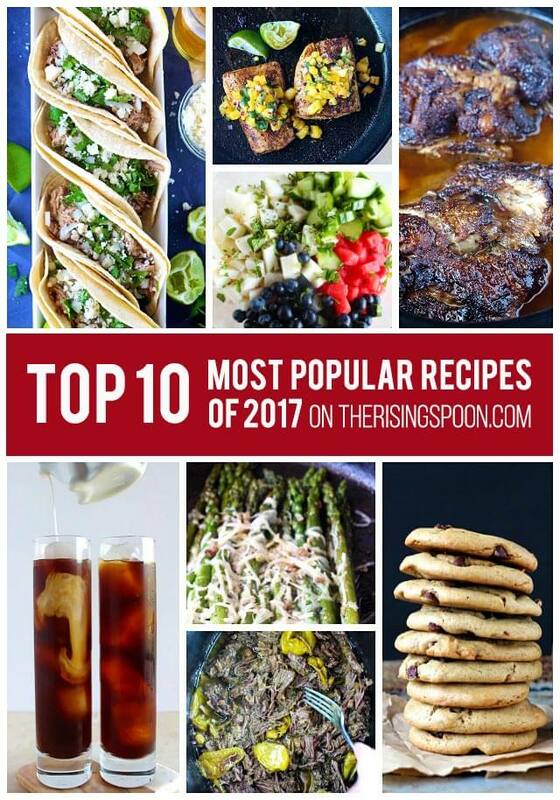 Here are the top ten most popular recipes from The Rising Spoon in 2017 (according to you guys)! I'm fudging the rules a bit and allowing this post from the end of 2016 because I published it at the very end of the year and it went nuts in the spring of 2017 when I made a "hands in pans" Facebook video for the cookies (my first ever). It currently has 600K+ views, and I'm gunning for 1 million by the end of summer (eek). The video helped illustrate the simplicity & quickness of the recipe and before I knew it, I had folks trying the cookies left & right, uploading pictures and leaving comments on Facebook, Instagram, and Pinterest letting me know they were ecstatic with the result. And several of my online friends went out of their way to test the recipe and spread the word. I am so thankful for their help. For us food bloggers, the best days are when someone actually makes our recipe, serves it to their family, it turns out well, and they leave us positive feedback via a comment, message, or email. It makes all the hard work worth it! 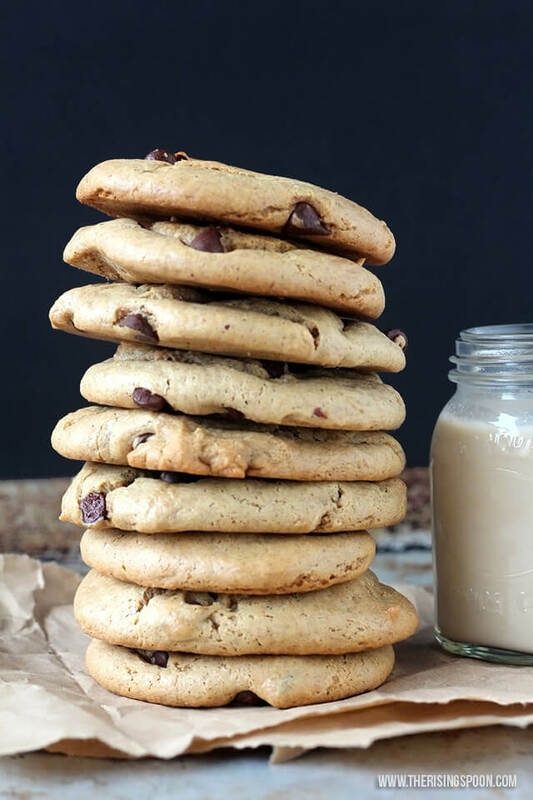 So, if you need a super quick and easy cookie recipe that won't put you into a sugar coma, is truly flourless (not even grain-free flours), and is easy to swap with other ingredients, give these a try. 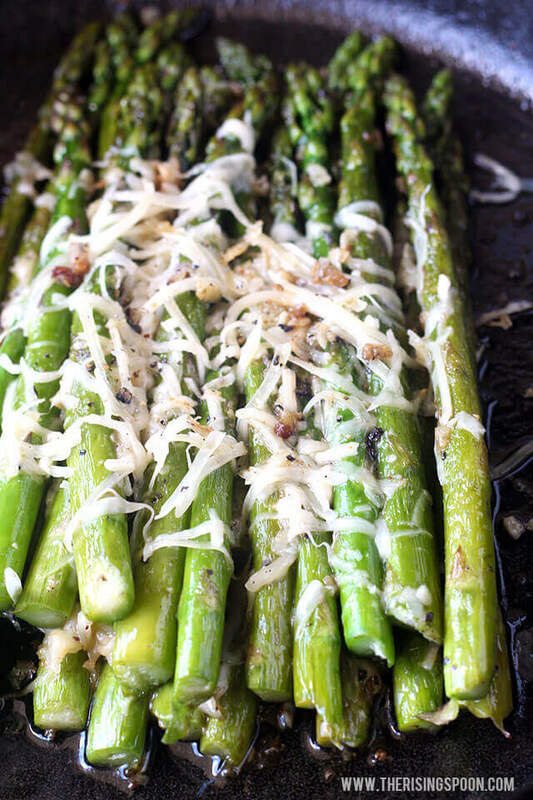 Asparagus is one of my favorite veggies (I could eat the whole bundle myself), and this is my go-to recipe for fixing it on the stovetop instead of the oven. I originally shared it back in 2013, but rephotographed it and published it in a new post last year and thanks to this pinterest pin from Onion Rings and Things, it took off immediately. Since then, many folks who're new to asparagus have fixed the recipe and left "tried it" feedback on Pinterest saying they are now asparagus lovers. I count that a huge win! If you're in the market for a tasty veggie recipe that only takes 10 minutes to fix and is elegant enough for a fancy dinner, yet simple enough for a weeknight meal - definitely give this a try! This is another recipe from The Rising Spoon archives (circa 2012) that I rephotographed and published this year. Slow cooker pork shoulder is my secret weapon when it comes to successful meal planning and food budgeting. It's inexpensive (look for it on sale) and yields LOTS of succulent, fork-tender meat. It also freezes well. So you can cook a big 8-9 lb. pork shoulder, use it for 4-5 different meals in one week, then flash freeze the rest in portions to use for recipes later on. 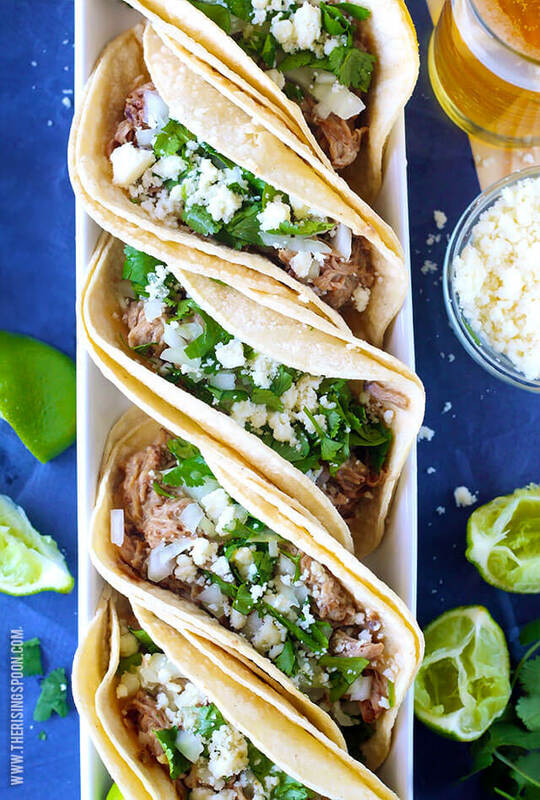 Check out my pork recipes index for several ways to transform the shredded meat (ex: tacos, burrito bowls, nachos, enchiladas, soup, BBQ sandwiches, stuffed avocados, etc.). This is one of the few super quick dinner recipes I have on The Rising Spoon (mine typically average 45+ minutes). I keep it in my back pocket for when I want a healthier meal without a lot of fuss. I stock up on frozen 2-packs of wild-caught fish filets like mahi-mahi or salmon at Trader Joe's that I can thaw last minute in the sink and serve it with simple sides like coconut milk rice, roasted green beans, or a leafy salad. 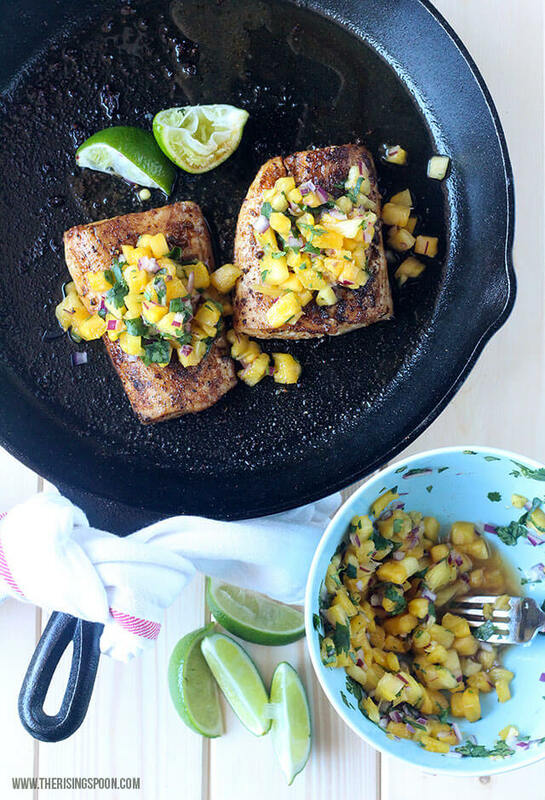 And if you're not into fish, I've had rave reviews (via the Pinterest "tried it" feature) for the pineapple salsa by itself, which would be excellent on chicken or pork. Switching to homemade cold brew coffee has saved us SO MUCH MONEY. My beau drinks it nearly every day year-round and before I figured out how to make it at home, he used to pay almost $5 a bottle. He drank probably 5-6 of them a week. That's a little over a $100 a month on average. I now use a ground brand that's $6.99/12 oz, which is about 16 cents less an ounce than the one I started with back in July, which was yielding 24 bottles worth and saving us about $87 a month. 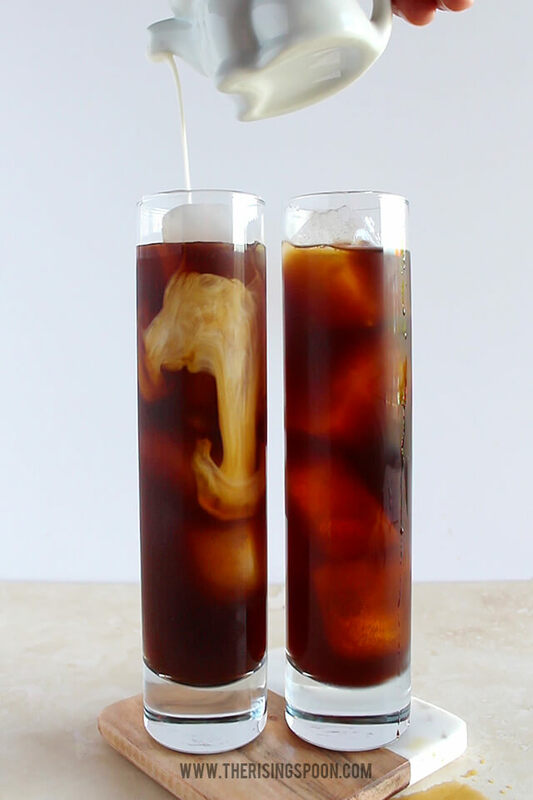 Aside from the cost, cold brew coffee is super duper easy to make (one of the easiest recipes on my site, in fact, with no fancy equipment required) and the coffee turns out smoother, less bitter, and stronger than regular iced coffee. If you or anyone in your life loves coffee, I recommend making this ASAP with your favorite beans. I know there are a million & one banana bread recipes out there. What makes this one worth trying? Many banana breads & quick breads in general call for a generous portion of cane sugar, almost to the point where it's a dessert bread. Not the best idea you're trying to eat a slice for breakfast or a snack and then have to deal with an ugly sugar crash soon after. This version has a good ratio of protein, fats & sweetener (and far less of the latter) so you can eat a slice or three and feel just fine. 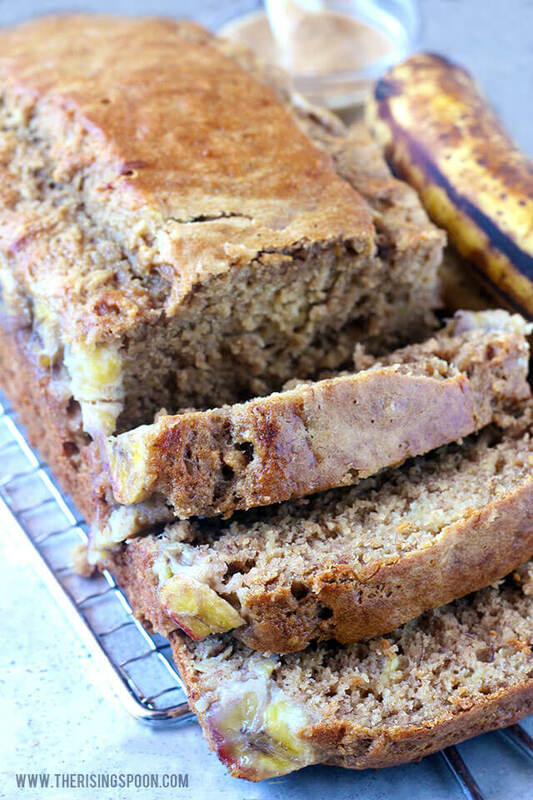 It's still moist, sweet, and fragrant like classic banana bread...just less like dessert. I typically keep a sliced loaf in my freezer and will pull one out and pop it under the broiler for a quick snack (it's yummy smeared with almond or peanut butter). 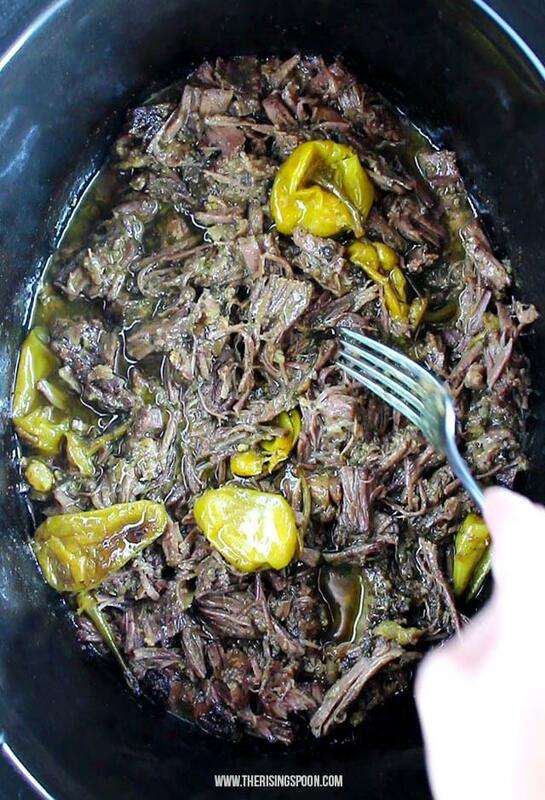 People go nuts over this slow cooker pot roast since it's packed with flavor from lots of dry seasonings and tangy pickled peppers and it only requires a handful of ingredients. It was at the top of my list to make for quite some time, but I held off because most recipes called for commercial dry ranch and onion soup packets, both of which were laden with MSG and other additives. I finally found a good homemade dry onion soup mix recipe and real food ranch seasoning packets, so I made this version, with options for paleo and whole30 folks (using ghee instead of butter). 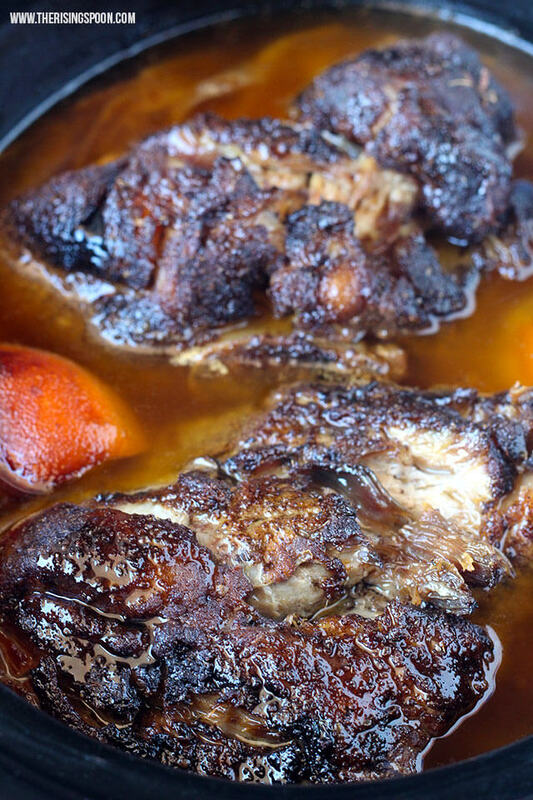 If you're used to regular ol' pot roast and need something new, definitely give this recipe a try. It takes less than 10 minutes to prep, is amazing over mashed potatoes, and the leftovers (if there are any) are excellent for sandwiches. If you already have the tender, shreddable pork shoulder made, these carnitas tacos come together in 15 minutes or less. Easy peasy! 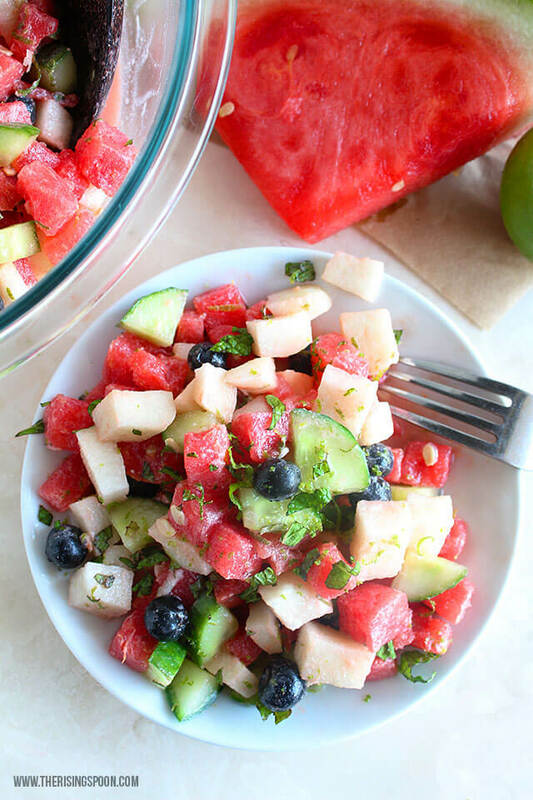 This healthy salad is full of hydrating & cooling foods like watermelon, cucumber & jicama (sort of like a savory apple) and is topped with an addicting coconut lime dressing. It is SO FRIGGIN GOOD. I can't wait for late spring so I can make this again for a snack or serve it with crock-pot ribs. Mmmm! I've been pretty obsessed with creamy soups the past year (ex: creamy chicken noodle soup and beef stroganoff soup) and Zuppa Toscana is at the top of my list. I make it at least monthly. It's so comforting and my version has some fresh chopped poblano peppers and crushed red pepper for a spicier kick. I like to serve it with crusty buttered bread or avocado oil potato chips for dunking and a bottle of habanero chile sauce on the side for extra heat. 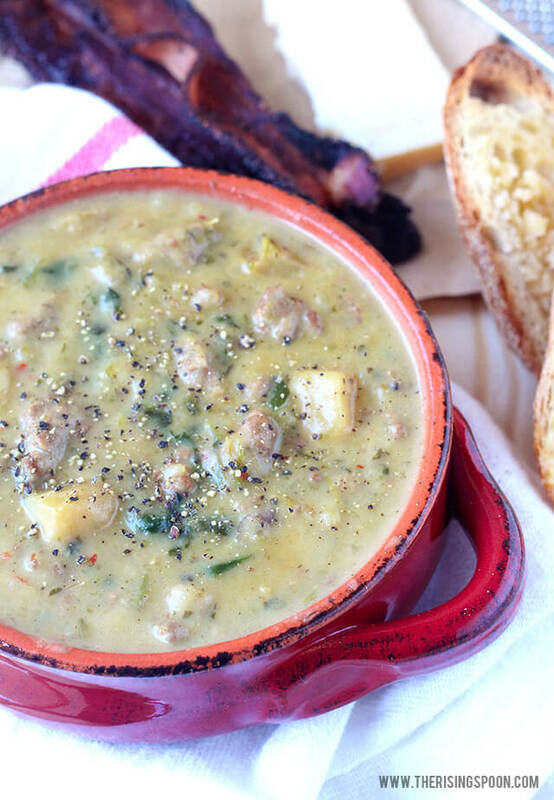 If you need a cozy soup recipe that has a short ingredients list and is easy to prep, give this potato & sausage soup a try. 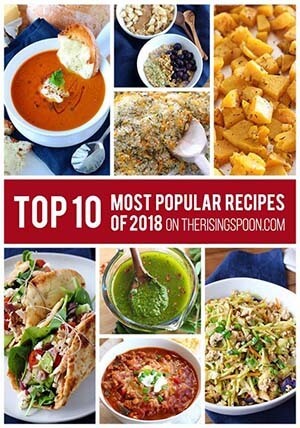 Again, thank you so much for supporting The Rising Spoon. Cheers to 2018 and may your new year be filled with good health, peace, and abundance!